A recent morning in Seattle began with rain—typical—but something much more unusual was happening in a school in Seattle’s University District. High schoolers leaned over the desks of middle school students, offering suggestions and encouragement as their younger peers blasted zombies and guided R2-D2 around obstacles. Rather than just playing video games, though, the teens were controlling the characters by writing instructions for them to follow. For Piper and her classmates who all have learning disabilities, bumping up against adults’ (and society’s) expectations can be a daily frustration. The difficulty translates into discouraging statistics: In the two years after high school, two-thirds of young people on the autism spectrum are unemployed and have no educational plans, according to a 2015 study. But many of these Seattle students have discovered that computer science is a natural complement to their skills and enthusiasm thanks to TEALS, the grassroots Microsoft Philanthropies-supported initiative that brings computer science (CS) education to schools nationwide. In their daily TEALS class, APL students are finding that creativity through technology offers freedom, fun and opportunities for a successful future. Piper and the other students in her class were led through coding tutorials by high schoolers and volunteer teachers from the school’s TEALS class. TEALS seeds CS programs in schools by matching technology professionals from over 400 companies with high school teachers. Over the course of a few years, volunteers not only instruct students on rigorous CS curricula and share insights about their own careers, but also train teachers to take over the class—thereby creating sustainable computer science programs for the school to continue independently. 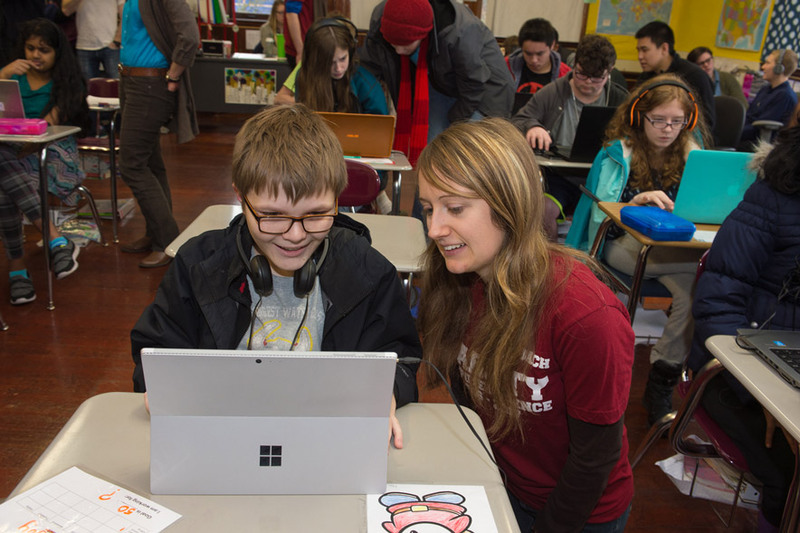 The morning that combined the TEALS and middle school classes was part of Hour of Code, a nationwide effort that introduces students to computer science. In addition to learning about programming from their peers, students came face to face with someone who proves a computer science career might be a possibility for them—autism and all. Katherine Hart, an engineer who joined Microsoft through a program that hires professionals on the autism spectrum, told the teens how she now works for one of the world’s leading technology companies. She got there not in spite of, but partly because of, her diagnosis. Prakash, the volunteer from Amazon, believes that many of the students in her high school computer science class wouldn’t have had the opportunity to dive into programming without the TEALS class. As she watches them thrive, reveling in their “aha!” moments when a coding concept clicks, she sees their “disability” as offering a unique advantage in the CS field. Back in the APL classroom, high schooler Ia Pixley helped another student try his hand at programming. Ia, who also plays the ukulele and wants to code a computer role-playing game someday, was surprised by how much she enjoyed teaching. For those who understand computer science, it’s no surprise: after all, computer science marks the spot where opportunity and fun intersect.